View the image – What do you see? Keep looking and ponder where it’s taking you. Although the plane was initially photographed on the ground at Barksdale Air Force Base in Louisiana, I have placed it flying above the white sands near the missile range in New Mexico. 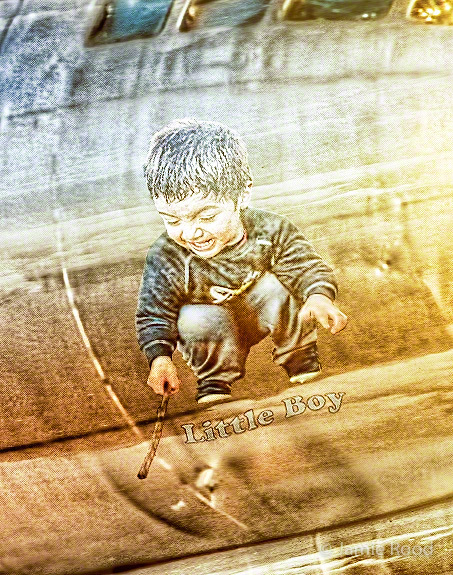 The reason is beyond aesthetics.Note the custom nose art featuring my grandson JC as the ‘Little Boy’. His more ornery than angry look down as he shakes a stick below – ‘take that!’, fits the narrative well and is also a commentary on the sad removal of the nose art on many of our historic aircraft. There are lighting and textural effects I’ve created here to help set the mood, and of course I’ve painted in the propeller blur, changed some things, and a lot more touch-up to finish out the piece. I’d really love to hear your overall impression of this newest aeronautical work, your thoughts on execution of the details, and especially ‘what it means to you’? You can purchase this Artwork along with other vintage aircraft & more in my Online Shop. This entry was posted on Thursday, August 9th, 2018 at 10:49 pmand is filed under . You can follow any responses to this entry through the RSS 2.0 feed. You can leave a response, or trackback from your own site.